Do you know what a guilty pleasure is? It is something that you enjoy but secretly know you shouldn’t because others say so. For some, it’s eating a McRib sandwich at McDonald’s, listening to an ABBA song, or watching a Bill Murray movie. You know it is not the highest form of food, music, or film, but you love it anyways. 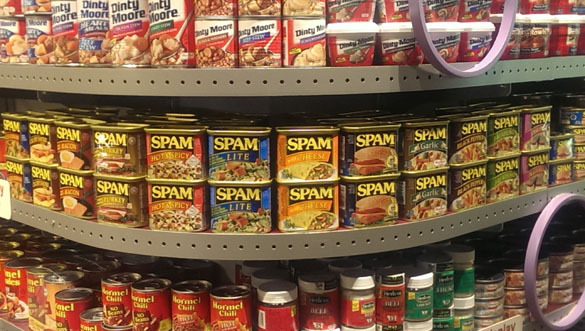 Without a doubt, the American spiced pork in a can, SPAM, falls directly in this category of guilty pleasures. 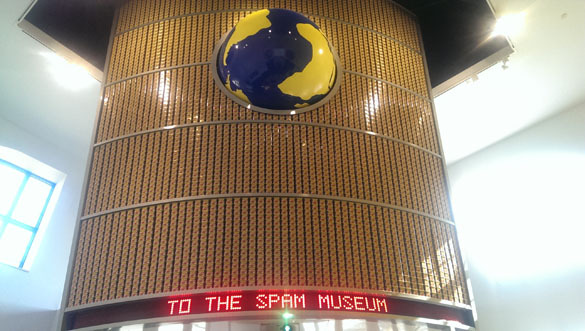 We had the pleasure of visiting the SPAM museum in Austin, Minnesota and wanted to share our fun experience. If you ever have a free half day in Minneapolis, consider making the 2-hour drive south to Austin, Minnesota. At this Austin, you won’t find the famous Texas brisket but rather, Hormel’s famous spiced pork shoulder/ham that’s been around since 1937. This pre-cooked meat combination is packaged in a can along with some salt, water, potato starch (moisture retention), sugar, and sodium nitrate (for color). Depending on your upbringing, you might have had this as a kid, on a trip to Hawaii or during a camping trip where the convenience and calorie count make sense. 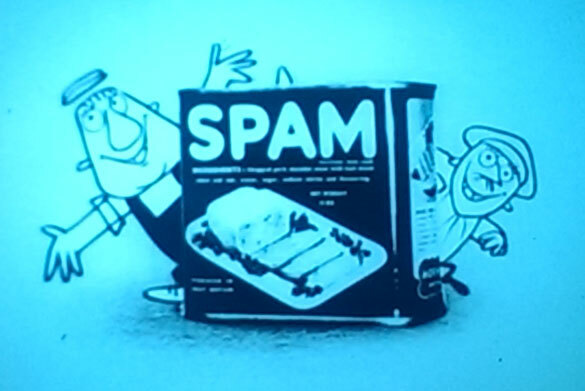 Whatever the case, I’ll admit that SPAM is sinfully delicious. 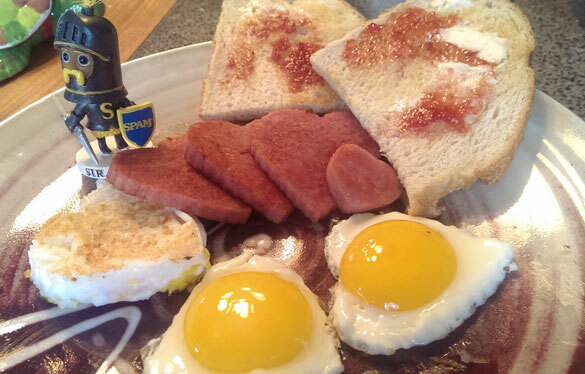 I love the salty, fatty and satisfying taste for breakfast, in a SPAM musubi or in SPAM fried rice. 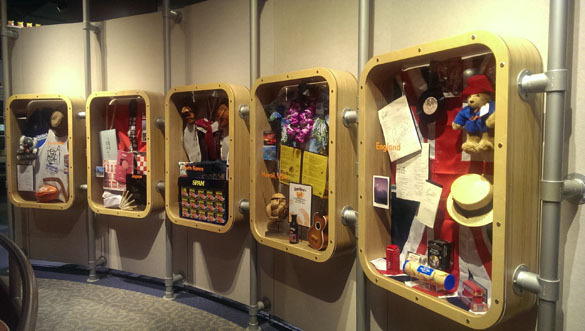 So when I found out that Hormel had a SPAM museum, I couldn’t get there quickly enough. 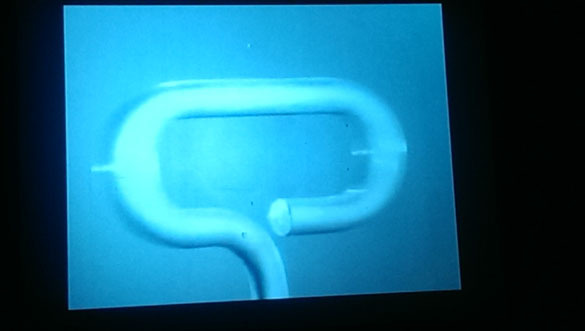 The headquarters and a manufacturing facility are located in Austin. I was told by the gift shop cashier that in Austin, you either worked for Hormel or the Mayo Clinic. 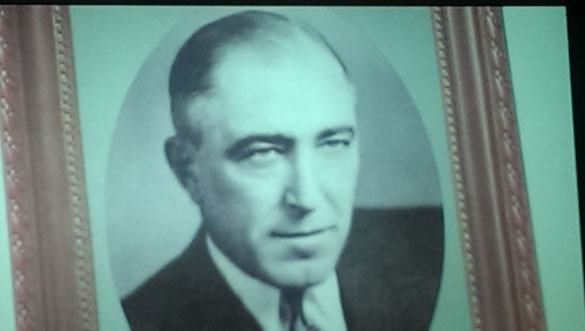 It is a small Minnesota town with one of the biggest and oldest corporations in the U.S. The museum itself is a 16,500 square foot brick building across the street from a large number of Hormel manufacturing facilities connected to conspicuous track of trains. Upon entering the museum, we were welcomed by a friendly host who explained that entry was free and self-guided. He pointed behind us and asked us to look up and lo and behold was a wall made up of hundreds of cans of SPAM in the middle of which rotated the earth. He handed us a very nice keepsake brochure and we walked through a giant sized can of SPAM to watch a short video history of SPAM. 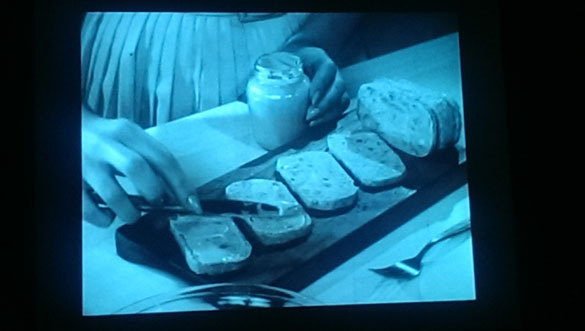 In a post-Food Channel world where cooking a dish can turn into an elaborate and impossibly timed competition, it is nice to take a break and remember when food was just food. 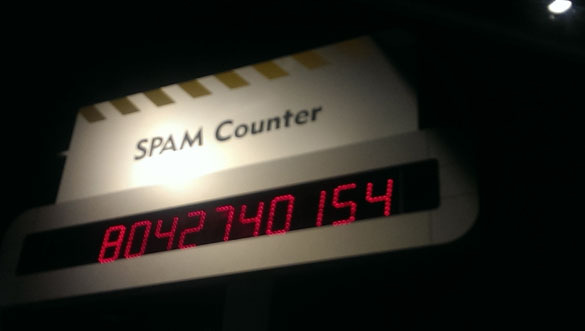 The SPAM museum doesn’t take itself too seriously recognizing its place in history. But it does a great job and spares no expense on elaborate displays of its origins and infiltration into American culture and sensibilities. 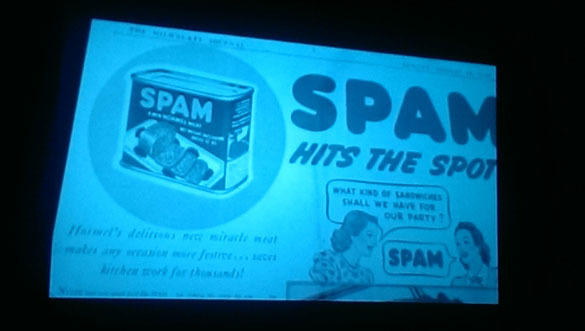 The museum explains how SPAM was rationed to our troops and allies during the WWII, shows old photos of the Hormel girls who danced and sang about Hormel products, has a game show quiz, a homage to the famous Monty Python’s Viking skit about SPAM, SPAM, SPAM which became popular in the 70’s and SPAM’s growth from selling its 2 billionth can in 1970 to its 7 billionth in 2007. There is even an elevated train track of SPAM cans that runs from room to room. 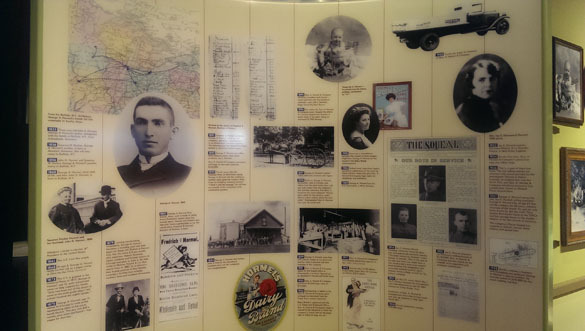 Just beyond the interactive display that challenges visitors to put a SPAM label quickly, you’ll find a full fledge display of Hormel’s product line which includes Skippy, Jennie-O, Dinty Moore and Famer John. At the very end of the tour is a gift shop. There you will find all 12 types of SPAM, SPAM jewelry, t-shirts, aprons, oven gloves, recipe book, stuffed animals and basketballs. I couldn’t leave without buying something and in my case; this was a pair of SPAM earrings, SPAM trivet, a t-shirt and a plush pig for my daughter. She affectionately names the pig quite appropriately, SPAMMY. 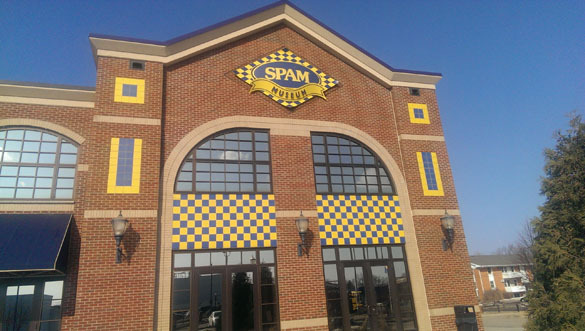 The SPAM museum, without a doubt, is a fun experience for the entire family and well worth a detour. 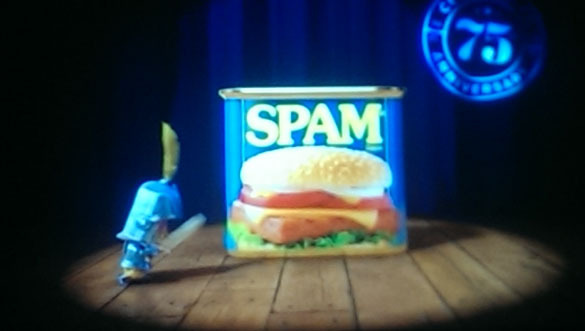 Spam has been one of my favorites since I was a little kid. Love it fried on white bread or bun with Miracle Whip. Spam rocks! I never met a Spam dish I didn’t like! Good to hear from you Dori.